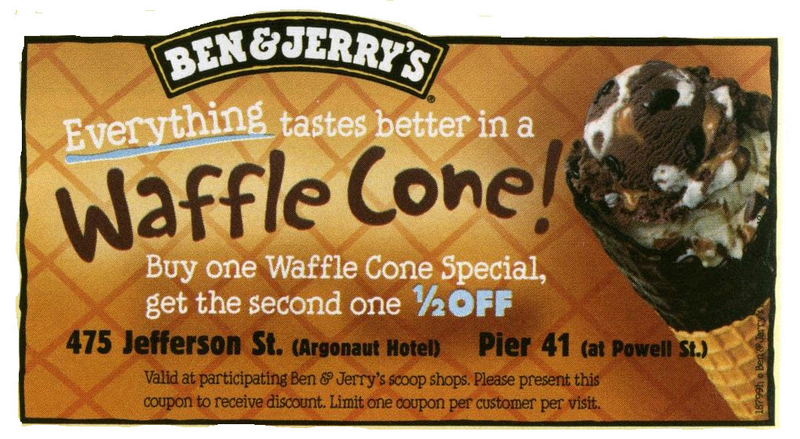 Buy One Waffle Cone Special, Get The Second One ½ Off at Ben & Jerry’s! Varies depending on location. Please call to confirm. Valid at participating Ben & Jerry's scoop shops. Please present this coupon to receive discount. 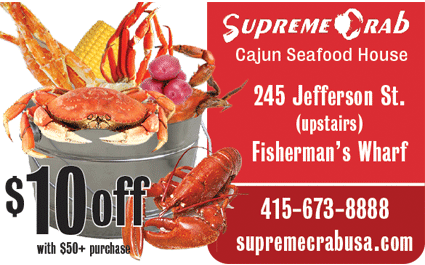 Limit one coupon per customer per visit. We offer freshly prepared quality seafood in Fisherman’s Wharf. Irresistible Cajun sauces with a combination of spicy, sweet and tangy flavors. 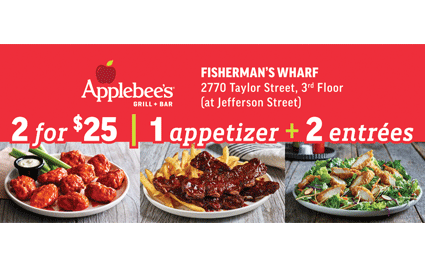 Visit Applebee’s and enjoy 1 appetizer and 2 entrees for $25. Welcome to the #1 Sports Bar and Entertainment Hub on PIER 39! Watch over 200 sports channels on 35 HDTVs, and choose from 15 beers on tap. Enjoy American favorites like burgers, pizza and steak, to the Little League menu for kids, and engage in hours of unending fun with the 85+ games in the arcade! Cannot be combined with other offers. Limit one offer per party. The gift shop in the San Francisco Railway Museum features a wide variety of unique San Francisco gifts, souvenirs, and memorabilia not available anywhere else. Present at time of Purchase. Discount good for 20% of any one item. Na Hoku. Hawaiian for “stars”. Once used by voyaging Polynesians as guides on their journeys throughout the Pacific. Today, Na Hoku is your guide to the essence of Hawaiian and Island Lifestyle captured in our collection of fine jewelry. Those who wear them will themselves glitter and shine for all to admire. Exotic. Tropical. Elegant. Na Hoku jewelry is designed to accent the individuality, taste and style of the woman who wears it. Every piece in our collection is a link to a moment in time, an intimate memory, or secret desire. Offer redeemable at time of purchase only. While supplies last. $30 retail value. 10% Off Thousands of Items with Macy’s 3 Day Visitor Savings Pass. The best brands, the biggest selection, plus 10% off for visitors! Print out the voucher and present it along with qualifying identification at any Macy’s location to receive your Macy’s Visitor Savings Pass, good for 10% off thousands of items throughout the store for 3 days! *Macy’s Domestic Visitor Savings Pass entitles you to 10% off merchandise purchases and must be redeemed in person at Macy’s. EXCLUDES: ALL: Deals of the Day, Doorbusters, Everyday Values (EDV), Last Act, M by Macy's Marketplace, Macy's Backstage, macys.com, specials, super buys, athletic clothing/shoes/accessories, cosmetics/fragrances, select designer jewelry/watches, designer sportswear, electrics/electronics, furniture, gift cards, gourmet foods, jewelry trunk shows, maternity, select licensed depts., mattresses, payment on credit accounts, previous purchases, restaurants, rugs, services, smart watches/jewelry, special orders, special purchase, select tech accessories, wine, 3Doodler, Apple products, Breitling, COACH, Eilen Fisher SYSTEM, Jack Spade, Kate Spade, Levi's, littleBits, Locker Room by Lids, select Michael Kors/Michael Michael Kors, Movado Bold, Samsung watches, Tempur-Pedic mattresses, The North Face, Tory Burch, Tumi, UGG, Vans, Vitamix & products offered by vendors who operate leased departments in any of our stores including: Burberry, Gucci, Longchamp & Louis Vuitton. Cannot be combined with any savings pass/coupon, extra discount or credit offer, except opening a new Macy's account. Extra savings % applied to reduced prices.